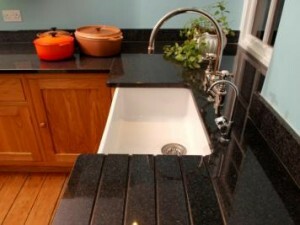 Nowadays it is easy to find granite worktops on a lot of kitchens. Here you can find some advice on how to remove stains from your granite surfaces. The mixture to use will be different depending on which kind of stain you have, but you will always need to prepare a poultice made of paper towel or talcum powder (acting as absorbent) and a specific chemical. If the stain is organic (coffee, tea, mustard,…), you will need to use Hydrogen Peroxide (30%-40% by volume) on the poultice. If the stain is inorganic (ink, dirt,…), you will need to use Hydrogen Peroxide (30%-40% by volume) on a paper towel or cloth. If the stain is from oil, you can use pure acetone on the poultice. 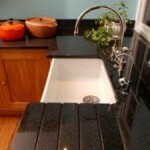 This entry was posted in How to... and tagged clean granite, cleaning tips, granite, remove stains on 25/05/2010 by admin.